In the Shadow of No Towers is Art Spiegelman’s reaction to the destruction of the World Trade Center. An oversized book, its thick cardboard pages give literal weightiness to its subject matter. It also adds a sense of wistful permanence (something the towers were missing) to a medium originally considered disposable. The cover is stark black, the front a simple outline of the towers, the back covered in outlines of old time comic characters spinning through space. 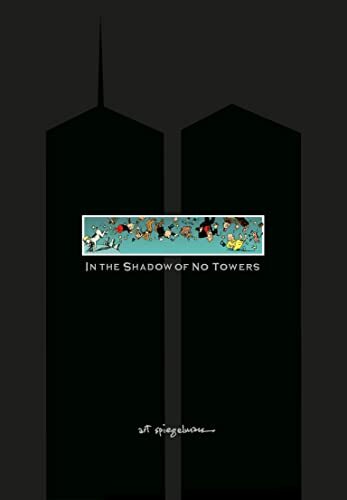 The latter reflects the significant role comics played in Spiegelman’s post-9/11 life, while at the same time grotesquely recalling the bodies that fell from the towers that day. It’s the first indication that Spiegelman is not offering a genteel commemorative album of placating thoughts. Contained within this elaborate packaging are two sections. The first is ten comics written and drawn by Spiegelman. These are not eulogies for the victims, nor do they contain sentimental words for their families. It’s a very personal work, about Spiegelman himself, not 9/11. He recounts how he and his wife frantically searched for their daughter that morning, told in the third person, as if distancing himself from the memory. He also tells the story of a homeless woman who shouted anti-Semitic abuse at him on a daily basis, and how he blew a TV interview by not giving the desired answers. And Spiegelman doesn’t shy away from what some might consider insensitive comments. He admits to originally not liking those "arrogant boxes," of feeling little connection to New York and of disliking the flag waving that’s occurred since 9/11, especially on its anniversaries. It’s unfortunate, but not surprising, that these comics were originally published in Germany, as no mainstream American magazine would carry them. In them, Spiegelman makes no secret of his contempt for the president, whom he refers to as that "creature in the White House." Still outraged at the 2000 "coup d’etat," Spiegelman accuses Bush of hijacking 9/11 and of squandering the goodwill of the world for the sake of his "damn oil war." Spiegelman presents these ideas in graphic form: Uncle Sam douses the flaming Tower Twins (actually, the Katzenjammer Kids) in oil. He then attacks the "iraknids" and stirs up a nest of hornets. The insects end up chasing the skeletal remains of the Tower Twins as Uncle Sam retreats to safety. There is no narrative that runs through these pages. They’re disjointed, self-proclaimed "fragmentary thoughts." There’s only one recurring image — the one that haunted Spiegelman the most: the frame of the North Tower just before it collapsed. Spiegelman uses a variety of styles and techniques to reflect his ideas. A newspaper-style comic strip claims the only change after 9/11 was a proliferation of flags. An editorial cartoon blames both the government and Al Qaeda for being equally terrorizing. While discussing an example of displacement — Halliburton and Enron are ignored while there is a media frenzy around Martha Stewart — Spiegelman’s body parts keep switching places. A shoe advertisement reveals the "waiting for the other shoe to drop" feeling that followed the attacks. Bush, Cheney, Ashcroft, and Rumsfeld, dubbed the "Architects of Armageddon" are drawn as EC-style monsters. Warm, pastoral colors are used to show the author’s reunion with his daughter, while offering a contrast to other observations: kids high-fiving when they hear of the attack on the Pentagon and people calmly watching the burning towers as if they were tourists. It’s unfortunate that Spiegelman opens this section with a prose introduction. Not only are some of his thoughts repeated in the comics themselves, making the introduction superfluous, but it undercuts the medium by suggesting that comics can’t stand alone without accompanying text. The second section of No Towers — seven comic pages from the early 20th century — opens with another introductory essay, this time a short history of the role William Hearst and Joseph Pulitzer played in helping create newspaper comics. Spiegelman also gives a little background on each of the reprints he’s included. Spiegelman claims that he found solace in those "vital" and "unpretentious" comics. But he’s carefully chosen comics that have a thematic connection — however tenuous — with 9/11. There are images of the Statue of Liberty waving a handkerchief, of the kids of Hogan’s Alley lining up during a "war scare," of Little Nemo moving through the streets of Lower Manhattan as another character knocks over skyscrapers, and of the title character in Bringing Up Father trying to keep the Tower of Pisa from falling over. Clearly, even when he seeks refuge in the innocence of old comics, echoes of the tragedy invade Spiegelman’s thoughts. For those of us unmoved by the supposed charms of older comics, Spiegelman belabors the point, and their inclusion feels like filler. It may seem gauche to complain about quantity, considering the subject matter, but take away the reprints and introductions, and all that’s left are Spiegelman’s original ten spreads. Along with the paltry content, the series — originally published in installments — loses something when collected together. Instead of a build-up, there is overlapping and repetition. Spiegelman’s tone also begins to grate. Overwhelmed by the continuing news and by conspiracy theories, he claims that instead of losing his life, he lost his mind. As with anyone who makes such a claim, it’s melodramatic and corny. Maybe more time is needed before our artists can adequately explore this event. After all, war novels that become classics (Red Badge of Courage, Johnny Got His Gun, Catch-22, Slaughterhouse-Five) often appear years after the events they depict. And movies about the American phase of the Vietnam War were inept propaganda (Green Berets) and overrated cartoons (Apocalypse Now) before Platoon and Full Metal Jacket finally appeared a dozen years after the USA’s involvement ended. Spiegelman is also trying to come to terms with an event that was watched live around the world, as were many individual human dramas connected with it. Much like the Apollo 11 moon landing, its very familiarity makes artistic representations difficult. Maus, Spiegelman’s landmark depiction of the Holocaust, is the kind of work that results in lifelong respect for its creator. And his In the Shadow of No Towers is certainly a welcome return to the comic book scene for Spiegelman. But while it’s a mature, honest work, there’s still room for something more cohesive and substantial.